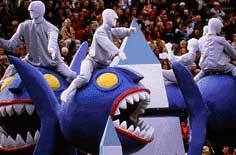 From January 31 to February 17, Nice will be the stage for an immense celebration and invites you to be a part of Carnival, "King of Euroland". Giant parades, Carnival parades and parades of lights, with their floats designed by cartoonists of the European press and built thanks to the know-how of the Carnavaliers of Nice, elegant batailles de fleurs (flower parades) along the Promenade des Anglais, musical groups, prestige soirées, entertainment, rock and techno concerts ... all the magic of Carnival will explode for more than a fortnight, with a unique programme of festivities ! Carnival in February also provides an opportunity to discover "greater Nice" in winter, stroll through the Old Town with its colorful narrow streets, visit museums, attend concerts, ballets or opera, sample the gastronomic cuisine, tour the hinterland and, finally, take in a little oxygen while enjoying the blue sky, the sun and the mild climate !